Here at Prestige Vaping we are constantly improving and expanding our sale network. As the market of electronic cigarette grows we are looking for retailers who would benefit from selling our products. The electronic cigarette market is booming so this offers retailers an opportunity to capitalize on this and provide its customers with a high quality product at good value prices. Having already been established and successful in selected Spar, Shell ,BP,Londis, Premier,Loco, Texaco,Nisa Local stores and numerous others we are seeking more stores as part of our national plan. Electronic cigarettes have become hugely popular in petrol filling stations, convenience stores, restaurants, cafes and pharmacies. However this does not mean that electronic cigarettes are confined to these places, in fact they could be popular in most if not all prominent retail location. We have an extensive range of point of sale material that would assist in promoting our products which are all available to our resellers. We will meet whatever the needs are of an individual retail store to enhance the display of our products. What to do to become a Prestige Vaping reseller ? Having assessed that becoming a reseller of Prestige Vaping could be a very profitable part of your business, the next step is to fill out our New Wholesale Account application form, once submitted we will determine whether a reseller is required in the particular area and if there is a requirement then we could set you up in a matter of a few days. What to do to open a Prestige Vaping franchise store ? As the market for electronic cigarette is growing rapidly, we have seen a sharpe rise in the opening of vape stores. If you are intereseted in opening a Prestige Vaping franchised store please fill out our New Wholesale Account application form and one of our dedicated franchise representative will contact you shortly. 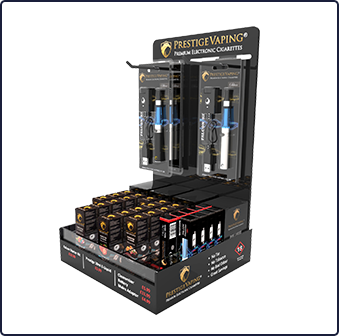 If you have any questions or queries in relation to becoming a reseller or if you would like one of our dedicated representatives to visit your store please feel free to email at: info@prestige-vaping.co.uk or call us on: 0845 3133381.